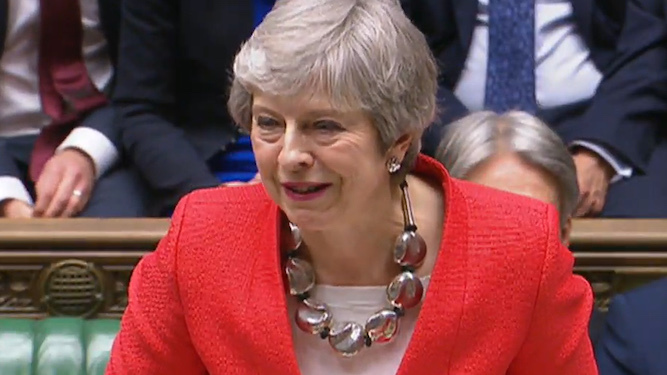 THERESA May has calculated that if her deal keeps gaining support at the current rate it only needs another six votes to pass unanimously. The prime minister has plotted votes from the Brexit withdrawal deal on blue squared graph paper and believes it will pass in three more hearings but she might as well go for the full six. She continued: “That’s the secret weapon in my arsenal, you see. I’ve got maths A-level. “And when I realised it was only the fourth-biggest defeat in parliamentary history I was delighted. Next time it’ll be 277 for and 356 against, then 312 for and 321 against, and so on. Alarm bells went off for Tom Booker during a cut-and-blow at Hair Today when chatty stylist Emma Bradford ominously mentioned immigration. Booker said: “It’s possible she could’ve been in favour of it, embracing multiculturalism and encouraging greater diversity in the hair-styling community. But I reckoned not. “It’s the nightmare scenario every British person dreads – someone saying vile, bigoted things and you being powerless not to tacitly agree, because that’s obviously better than causing a fuss. “I distracted her by asking about her Yorkshire terrier, and things were fine for a bit then she started talking about ‘who really controls the world’. “Anti-semitism is completely unacceptable, but I’m pretty cowardly and she was snipping away with razor-sharp scissors near my delicate pink ears. So I said ‘mmm’.